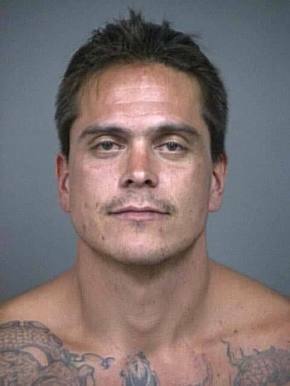 San Luis Obispo Police arrested a parolee who threatened to kill officers before violently resisting arrest on Thursday at 4 a.m.
Jason McMaster, 37, initially responded when ordered to lie down on the ground. However, when officers attempted to cuff the unintelligible suspect, he fought his way back to a standing position and charged the officers, police said. Officers ultimately gained control and took the profusely sweating McMaster into custody before transporting him to Sierra Vista Hospital for treatment. Several officers received abrasions and bruising during the skirmish. McMaster, who has a history of violent crimes and assaulting law enforcement officers, was paroled from prison in February. Officers booked McMaster into County Jail on suspicion of criminal threats, assault on a police officer, disturbing the peace and resisting arrest. Many of the SLO Police Officers I have seen are very normal community type persons or people. They are about where I have hope LE would be (The selection process). I am very pleased ordinary people LE are well trained. I agree with bob and presuming the reporting is accurate and no tazer was used, then I too have to congratulate them on a job well done. And that’s coming from their biggest critic. I am very glad that none of the police officers were hurt more than reported, and that apparently all of the officers kept their cool enough not to shoot the suspect. I did not see any mention of a tazer in the reporting here, so I am curious if the “training” that was taught by Chuck Liddel was of any help in subduing this out of control man. Good job officers, if the reporting here is accurate.